Educators self-assess their performance using student data and The Standards and Indicators of Effective Teaching Practice and/or Administrative Leadership rubric. Educators propose goals related to their professional practice and student learning needs. Educators are required to consider team goal and evaluators have final authority over goals. If both are not in agreement, or if the educator does not feel that either goal is not “SMART,” it is brought before the supervising evaluator. If the issue cannot be resolve, contact CEA leadership. Developing Educator Plan (1-year cycle): For educators without Professional Teaching status, administrators in the first three years in a district, or at the discretion of an evaluator for an educator in a new assignment. Self-Directed Growth Plan (2-year cycle): For experienced educators rated proficient or exemplary on their last evaluation; these plans can be one or two years in length. Directed Growth Plan (1-year cycle): For educators rated in need of improvement of on their last evaluation. Improvement Plan (1-year cycle): For educators rated unsatisfactory on their last evaluation. Making resources and supports available. Observing practice and providing regular and specific feedback on performance. Monitoring progress – including midpoint check-ins. Identifying, collecting & organizing artifacts/evidence related to goal progress. Teachers on a 2-year cycle are not expected to have all required evidence by the end of the first year, but should have shown some progress for Standards III & IV, unless the evaluator requests to see something specifically. Teachers should collaborate with evaluators to ensure adequate compliance with expectations. Feedback given on evaluations should be provided in writing or on Teachpoint within 3-5 days of the observation in order for any information to be included in the formative or summative evaluations. It should be focused, evidenced-based, and constructive with the intent of improving teaching practices. Any person feeling that the feedback on their evaluation is not accurate and/or the observation settings are not varied is encouraged to discuss their concerns with their building representative. If an evaluator has observed a teacher’s proficient and/or exemplary level of performance, it can be incorporated into any of the written feedback forms/reports WITHOUT an artifact. Formative Assessment/Evaluation – Provided at halfway point of cycle depending on plan. Educator submits collected data to evaluator, who summarizes the data collected coming to a formative rating on each of the four standards of professional practice and/or assessment of progress toward goals. Evaluator provides feedback to the educator to help him or her improve professional practice. For any information derived from an observation, feedback MUST have been given to the educator in writing or on Teachpoint within 3-5 days of the observation. Evidence of the attainment of goals. For any information derived from an observation, feedback MUST have been given to the evaluator in writing or on Teachpoint within 3-5 days of the observation. Educator uses Summative Evaluation to inform Self-Assessment for the next cycle. The new regulations from DESE provide for four categories of performance ratings: “Exemplary,” “Proficient,” “Needs Improvement,” and “Unsatisfactory.” Each rating contributes to an individual educational plan for every educator. Plans are different for teachers with “Professional Status” and for those with “Developing Status” (see four plan types above). Each educator should be aware of what their rating is at the start of the school year. The category determines the type of plan and the length of the plan. Changes can occur during the year. Educators are required to prepare a Self-Assessment and to develop two specific goals for the year, a Student Learning and Professional Practice goal (see description above). These goals may be individualized or team goals, based on grade, content area or cluster. This plan must then be approved by the evaluator, or the principal in most cases. The plan may also be sent back to the educator for revision before approval. Evidence may be collected in a binder and/or Teachpoint Software (goteachpoint.com). Evidence may be entered by both the evaluator and the educator. For training in Teachpoint and the collection/organization of evidence, ask your evaluator to set up time for professional development with a knowledgeable staff member and/or Christine Theroux, CEA Vice President. Notices will be sent out electronically when information is entered into the system. It is very important that members monitor their plan on this system. A Formative evaluation is given in the middle of the cycle and a Summative evaluation is given at the end of a plan cycle. Regardless of whether it is a one or a two year plan, evaluations will continue through the cycle or begin again once completed. Teachers on a 2-year cycle are not expected to have all required evidence by the end of the first year, but should have shown some progress for Standards III & IV, unless the evaluator requests to see something specifically. Teachers should collaborate with evaluators to ensure adequate compliance with expectations. Teachers beginning the 2nd year of their 2-year evaluation cycle do NOT have to submit goals unless contacted by the evaluator because one (or both) was already accomplished. Complete a Self-Assessment, Student Learning and Professional SMART Goals, and an Educator Plan with the evaluator by November 1, 2013. Staff in second year of plan should not have to redo their goals and Self-Assessment because they are in the middle of the evaluation cycle. Interpret communications regarding the evaluation system to include all Unit A faculty (i.e. counselors, team chairpersons, psychologists, speech pathologists, librarians, etc.) when the term “teacher” is used because there are too many specialized positions in each building to name. Language regarding many elements of this new evaluation are still being negotiated. Especially regarding DDM’s, multiple measure of student learning, rating of educator impact, trends in student learning, and student learning goals. Updated information will be added under this section. In an effort to assist with Chicopee’s implementation of the new evaluation tool, an Implementation (joint-labor) Committee was developed in September of 2012. The committee is composed of support staff, guidance, Unit B, elementary, middle and high school representatives, and is co-chaired by Christine Theroux, CEA Vice President, and Steve Nembirkow, Director of Human Resources. The committee meets on the first Friday of each month from 12:45 to 2:15 pm. Please forward questions, concerns or suggestions to Christine Theroux at: ctheroux@chicopeeeducators.org. After each meeting, notes with decisions, clarifications and established procedures will posted on the CEA and Human Resource websites. To further enhance the consistency of the implementation of the new evaluation tool throughout the district, the committee will begin a random file cabinet review of evaluations in August 2014. Feedback given on evaluations should be focused, evidenced-based, and constructive with the intent of improving teaching practices, and all observations should be conducted in varied settings. Any educator feeling that the feedback on their evaluation is not accurate and/or the observation settings are not varied is encouraged to discuss their concerns with their evaluator, first. The next course of action, if needed, is to seek the assistance of a building representative who can help put you in touch with someone who can help. It is important for members to keep us informed of inconsistencies and inaccuracies regarding evaluation so that we can address issues with the Implementation Committee. Currently, language for SMART goals and District Determined Measures (DDMs) is being negotiated to eventually be put into the contract. The Student Learning Goal vs. DDM was discussed at the June 2014 Implementation Committee meeting, realizing that there continues to be misunderstandings about the intent of a Student Learning goal. The Student Learning goal should measure growth and it needs to be “measurable,” but that does not necessarily mean by percentages. It should NOT be based on student performance (product), but on a teacher’s goal to assist in their learning (process). Steve Nembirkow’s example: “My class will show appreciable growth in the area of Open Responses. “ For example, if a teacher has to measure Open Response, it cannot be based on district/school produced questions because the questions can be inaccurate or given before the standard is finished, etc. Each educator assesses his or her practice using the professional practice rubric. Consider strengths/needs, practices, processes, and structures that you can build upon at your school. Keep in mind specific times during the year that reflection and analysis already occur. Briefly summarize areas of strength and high-priority concerns for students under your responsibility for the upcoming school year. Cite evidence such as results from available assessments. What needs jump out at you as the most pressing, but yet can be accomplished within your cycle? Do you see any that could be combined into a concrete student learning goal or a professional practice goal? Do you see any opportunities for alignment between a student learning goal and a professional practice goal? Once the educator determines current students’ knowledge/skills on key standards, the Self-Assesment form is completed. The form can be found in Teachpoint: https://tp1.goteachpoint.com/. Seek the help of your mentor for assistance if unsure of what is co-constructed with the evaluator. The sample teacher plans appear in two sets. The first set of sample teacher plans that begin with “Full PLAN” contain the Professional Practice SMART Goal and the Student Learning (performance) SMART Goal. The grade level and/or subject follows next in the name. Finally, the sample teacher plans in the first set indicate whether the Professional Practice goal is the Common Core goal or the Educator Evaluation System goal. Please note that these are sample goals and teachers are not required to use them. The second set of sample teacher plans begin with “Tchperfgoalonly,” followed by the grade level. These plans only contain the Professional Practice Goal for implementing the Common Core. Please note that all examples are from the 2012-13 school year. Quotations, observed actions or movements by teacher and students, literacy descriptors, etc. EVIDENCE EXAMPLE: Students constructed sailboats using various types of materials independently. JUDGMENT EXAMPLE: Teacher wasn’t engaged enough with the students and just sat at his desk. Observations and write-ups should take place over a period of time, as opposed to being crammed into a short period of time. It is the evaluator’s responsibility to not only identify ways for the educator to improve, but to also show how they are helping them. Walkthroughs should not interrupt the learning environment. If an educator feels that the manner in which they are conducted and/or number of instances is disruptive, they are encouraged to keep track and have a conversation with the evaluator. They may also follow-up with an Educator Response form or contact a CEA representative. The number of walkthroughs an evaluator conducts are randomly monitored by HR through the use of cabinet reviews. If an educator receives feedback or a formative/summative evaluation that is not accurate, focused, evidenced-based, constructive and/or timely, we encourage you to have a conversation with the evaluator to clarify misunderstandings. If not successful, an Educator Response form found on Teachpoint can be submitted. This form is intended to be used in support of the educator, should he/she want to have a formal response to any part of the evaluation process kept on record. It will be completed by the educator; the evaluator will sign to acknowledge receipt. If the form is submitted in response to the Formative Assessment/Evaluation or to the Summative Evaluation, receipt of the response will also be noted and initialed in Teachpoint. The Formative Assessment Report form is intended to be used in support of an educator’s formative assessment (Step 4) at the mid-point of the evaluation cycle, at minimum; it can be used multiple times as Formative Assessment can be ongoing. It will be completed by the evaluator. Evaluators are not required to assess both progress toward goals and performance on Standards; they will check off whether they are evaluating “Progress toward Attaining Goals,” “Performance on each Standard,” or both. Evaluators will provide a brief narrative of progress that includes feedback for improvement. Educators sign off to indicate that they have received a copy of the report and may use the Educator Response Form to provide a written response. The Formative Evaluation form is intended to be used in support of an educator’s formative evaluation at the end of year one of a two-year Self-Directed Growth Plan. It will be completed by the evaluator. Evaluators are not required to assess both progress toward goals and performance on Standards; they will check off whether they are evaluating “Progress toward Attaining Goals,” “Performance on each Standard,” or both. Evaluators will provide a brief narrative of progress that includes feedback for improvement. 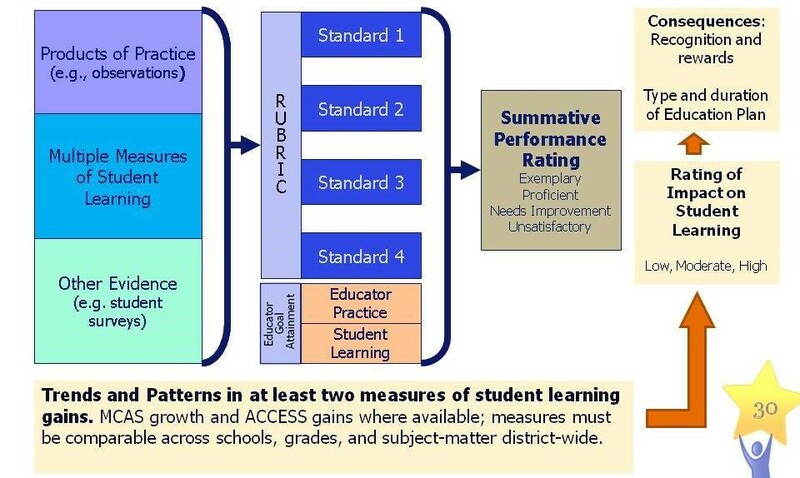 At the point of Formative Evaluation, the overall rating is assumed to be the same as the prior summative evaluation unless evidence demonstrates a significant change in performance leading to a change in Overall Rating and, possibly, Educator Plan. If there is a change in rating, evaluators must provide comments on each of the four Standards briefly describing why the rating has changed, the evidence that led to a change in rating, and offering feedback for improvement (evaluators are encouraged to provide comments even if there is no change to ensure that educators have a clear sense of their progress and performance and receive feedback for improvement). Educators sign off through Teachpoint to indicate that they have received a copy of the report and may use the Educator Response Form to provide a written response. Completion of this form will be noted and initialed on the Educator Tracking Sheet. The Summative Evaluation Report Form is intended to be used for Step 5: Summative Evaluation. This form applies to all Educator Plans. 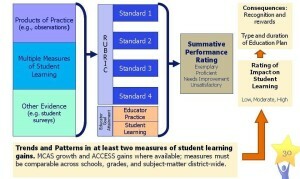 All sections must be completed by the evaluator, which are: “Attainment of Student Learning Goal(s),” “Attainment of Professional Practice Goal(s), “Rating on each Standard,” “Overall Performance Rating,” and “Plan Moving Forward.” Evaluators must provide comments on the Student Learning goal(s), Professional Practice goal(s), each of the four Standards, and the overall rating briefly describing the level of attainment or performance rating, the evidence that led to the level of attainment/rating, and offering feedback for improvement. Educators sign off through Teachpoint to indicate that they have received a copy of the report and may use the Educator Response Form to provide a written response. Educators in need of guidance through the process should contact Christine Theroux at: ctheroux@chicopeeeducators.org.